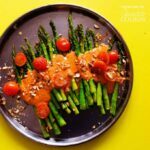 Roasted Asparagus: topped with healthy smokey romesco sauce! 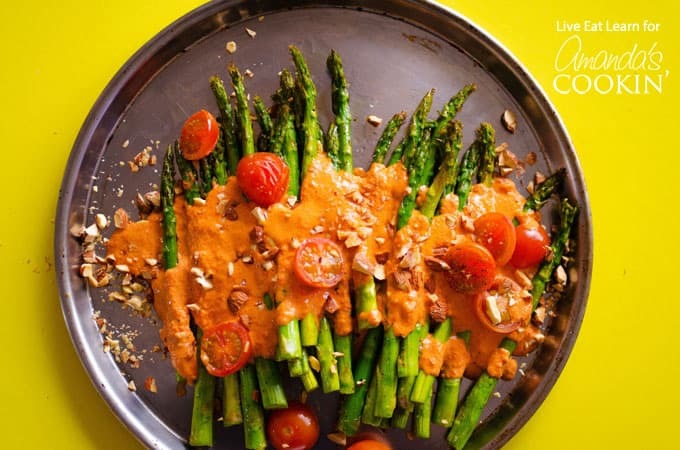 This roasted asparagus side dish is covered in delicious and healthy Smoky Romesco Sauce, cherry tomatoes, and crunchy chopped almonds. And the best part? This colorful showstopper takes just 20 minutes! When I was brainstorming up recipes to make this week, I realized something…I like, never share side dish recipes with you guys. I’m all about main courses and smoothies, but since when did side dishes become an afterthought? Today we’re changing that. 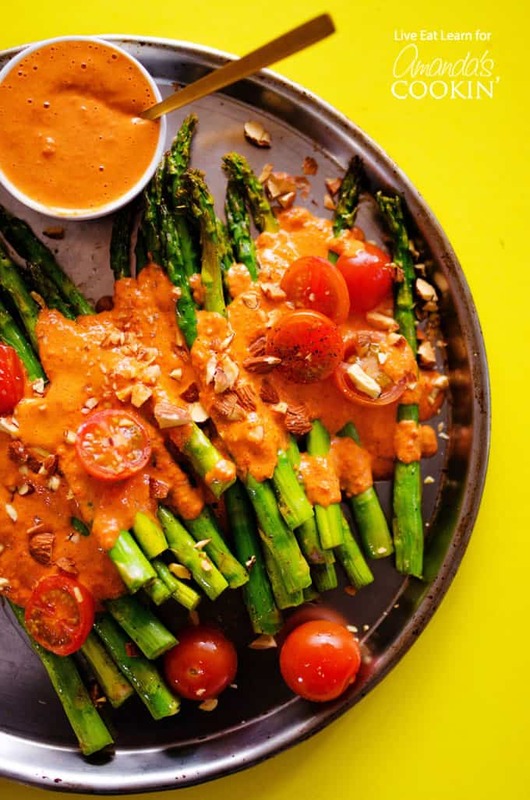 Today, the side dish is going to be the star of your meal, because this Roasted Asparagus with Smoky Romesco Sauce is so colorful and flavorful and seriously packed with nutrition. I love it so much and I think you will too! Let’s talk about this magic red sauce we call “romesco”. I’ve become a bit of a sauce person since moving in with my boyfriend. Here in Holland, they put different sauces on everything. We have a whole rack in our fridge dedicated to about twenty bottles of different sauces, so no meal ever goes unaccompanied. So while scheming up ways to make the roasted asparagus really pack a flavor punch, my first thought jumped to sauces. The sauce we’re making today, romesco, is a Spanish-style sauce that involves tomatoes, roasted red pepper, and nuts! 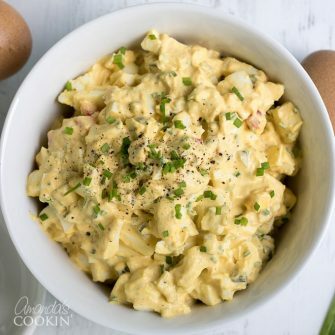 It’s super simple and I swear, you’ll be putting it on everything once you try it. RELATED – Love romesco? Try our Smoky Romesco Soup or our Romesco Hummus! This healthy roasted asparagus would go great with this Dijon-Lemon Caper Salmon. 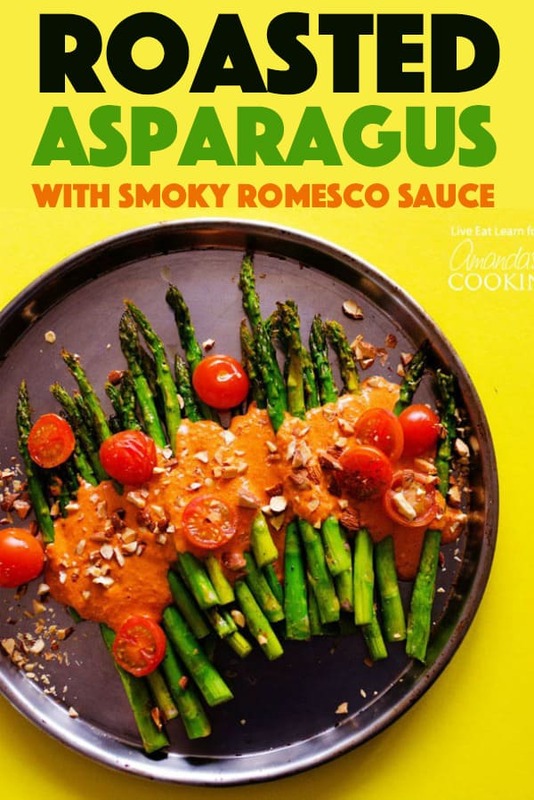 Not only is this roasted asparagus side dish good for you, but it looks amazing too! Are you an asparagus fan? If so, check out this delicious Cream of Asparagus Soup recipe. You may also be interested in this Pan-Seared Gnocchi with Shaved Asparagus and Snap Peas for a filling, and ultra tasty dinner! This Roasted Asparagus dish is covered in delicious and healthy Smoky Romesco Sauce, cherry tomatoes, and crunchy chopped almonds. And the best part? This colorful show stopper takes just 20 minutes! Preheat oven to 400 degrees F (205 C). Wash and trim off tough ends of the asparagus, using a vegetable peeler to remove the tough skin of the bottom if it’s too thick. Set on a parchment paper-lined baking sheet with the tomatoes. Drizzle with a tablespoon or so of olive oil, sprinkle on a pinch of salt and pepper, and toss to coat. Cook for 10 to 15 minutes, until asparagus spears are tender with poked with a fork. Once cooked, make the romesco sauce by placing 1 cup of the cherry tomatoes you just cooked into a food processor along with roasted pepper, olive oil, almond butter, garlic, lemon juice, paprika, and salt. Blend until smooth and creamy.